Welcome to The Cookie Elf File! About once a week, The Elf will send you a favorite cookie recipe, complete with a list of ingredients and instructions. The Elf will also occasionally include baking tips from The File to help you bake and enjoy homemade cookies in your own kitchen. 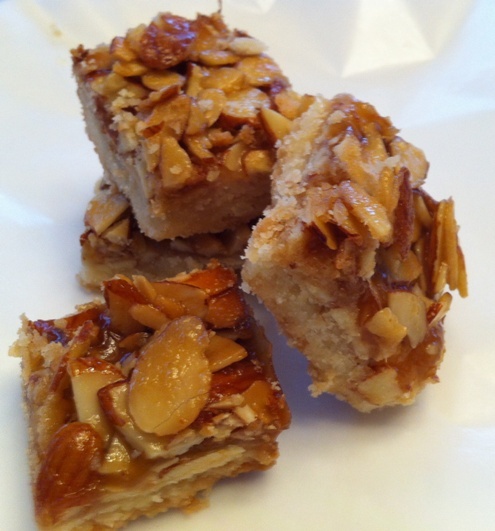 In honor of National Shortbread Day (January 6), this week The Cookie Elf recommends Almond Shortbread Bars. A variation of classic shortbread recipe, Almond Shortbread Bars follows the time-honored ratio for this cookie’s traditional three key ingredients: one part sugar, two parts butter, and three parts white flour. In this version, a shortbread crust is topped with a yummy syrup and nut layer flavored with almonds.